Dyed-in-the-wool co-op shooters are something of a rarity. Though recent titles like Halo 5: Guardians have incorporated explicit cooperative features into their campaigns, few take a comprehensive approach to making this gameplay style the focus of the experience. Earthfall was born out of that perceived gap in gaming, with developer Holospark looking to replicate the experience of something like the Left 4 Dead series while bringing new ideas to the table. Earthfall takes places in the aftermath of a meteor strike that decimates the world and leads to alien species overrunning the planet. A ragtag group of survivors must join forces and fight back against the invading hordes, and it’s here that the adventure begins. 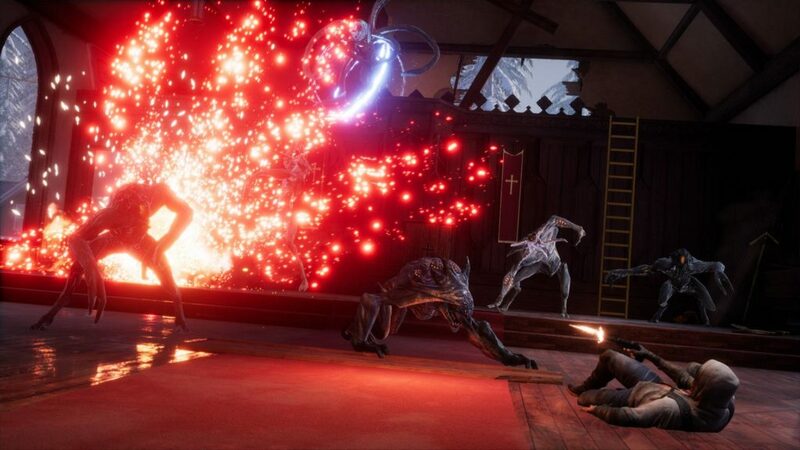 Earthfall takes the idea of a cooperative adventure and runs with it from the beginning; you and up to three friends can tackle the game’s lengthy levels, but if you need to play solo, the game will turn the rest of your companions into bots. In cooperative shooters, the core gameplay is everything, and Earthfall doesn’t disappoint. In keeping with the apocalyptic nature of the story, players must scavenge for guns and ammo as they progress. You always have access to a pistol with endless ammo, so you’re never completely unarmed, but this gun limits your offensive capability; to effectively fend off the game’s overwhelming waves of aliens, you’ll need the bigger guns. Shooting is accurate and satisfying with small touches and enhancements throughout. For example, you can blow limbs off of certain enemies, and they will stagger and wiggle around without those limbs before you kill them. To help keep powerful weapons in your hands, the game makes use of one of its unique hooks: the 3D printer mechanic. Scattered throughout the levels are printers that give you instant access to dozens of different types of weapons. If you’re lucky enough to find yourself near one of these stations, you’ll be able to find a more appropriate weapon for the situation you find yourself in, and this lets you approach a tough fight more thoughtfully. There are several different enemy types, and each will challenge you in different ways. There are standard gun-fodder aliens that don’t pose much of a threat on their own, but can annoy you in large groups, while the more specialized enemies makes things more interesting, Gooey, gelatinous enemies release noxious gas upon death. Aggressive aliens can pin you down and slowly eat away at your health, while others can pick you up and carry you away from the action; in both cases, one of your teammates will need to kill the alien in question before you can get back in the action. Durable, shielded aliens will file projectiles at you from a distance, and they can warp you around the level. 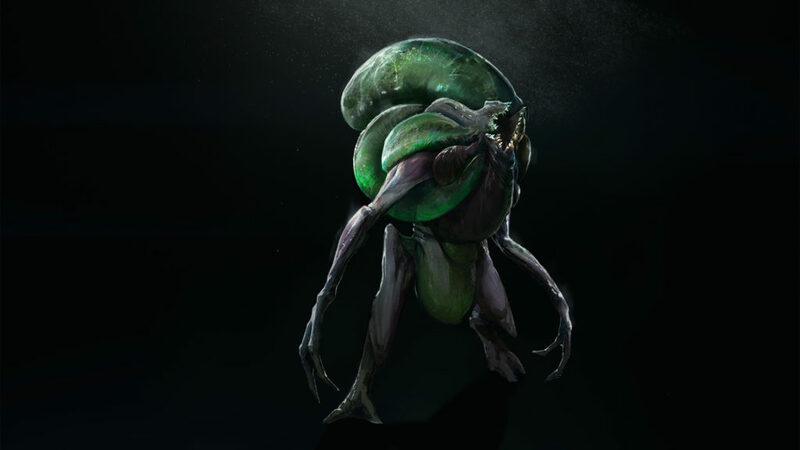 Each alien brings its own unique challenge to the table – the Sapper, for example, releases harmful gas when you kill it. Earthfall isn’t afraid to throw all of these enemies at you at once, so teamwork and coordination is critical. Players can wall up in enclosed spaces by setting up barricades on doors, but enemies can break through and breach your position from other angles, so staying vigilant is key. Health stations are scattered through the levels, which helps keep everyone in fighting shape, but you may fall to the alien hordes at some point. When you do, you can continue shooting from a prone position, which helps you defend yourself. You will eventually bleed out, however, and a teammate will need to revive you; helpfully, there is no limit to how many times you can be picked up. First-person shooting remains a popular genre with no shortage of polished entries, and Earthfall hopes to stand out with its approach to the shared experience of play. At a time when much of the industry has moved away from developed campaigns in favor of competitive online multiplayer, it’s refreshing to see titles that continue to commit to the co-op campaign experience. If you miss the likes of Left 4 Dead or similar shooters that put cooperative gameplay first, you’ll want to keep an eye on this one. Earthfall is currently in Early Access on Steam. The final release will be available on PC, Xbox One, and PlayStation 4 this spring for $29.99.